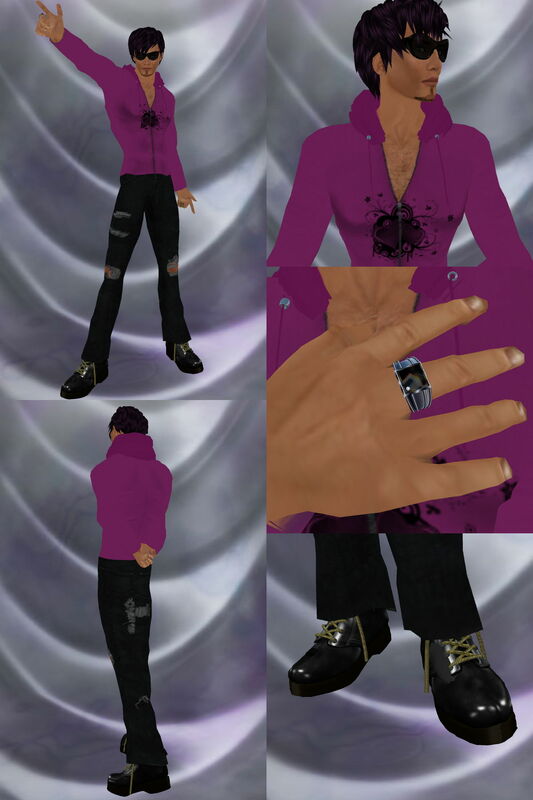 HugoZion Kondor is a new designer in world. He started his business in May 2008. His first collection under the brand “JHZ Store” offers a small range of T-shirts and jeans, plus a few accessories. T-shirts come in subdued tones, offering nice graphic patterns that will please the men for sure. I hope, though, that his next collection will offer more bright colors and more items out of the “basics” field. Everything is set modify copy no transfer. The textures are very precise and defined. I’m showing today a pair of jeans with discreet but interesting drawing on them, and an off-white tee with a cool motorbike on it. Watch and bracelet easily achieve a masculine and contemporary look. Although his prices are not the lowest, you need to pay his shop a visit if you want to explore less known creations and support new designers! 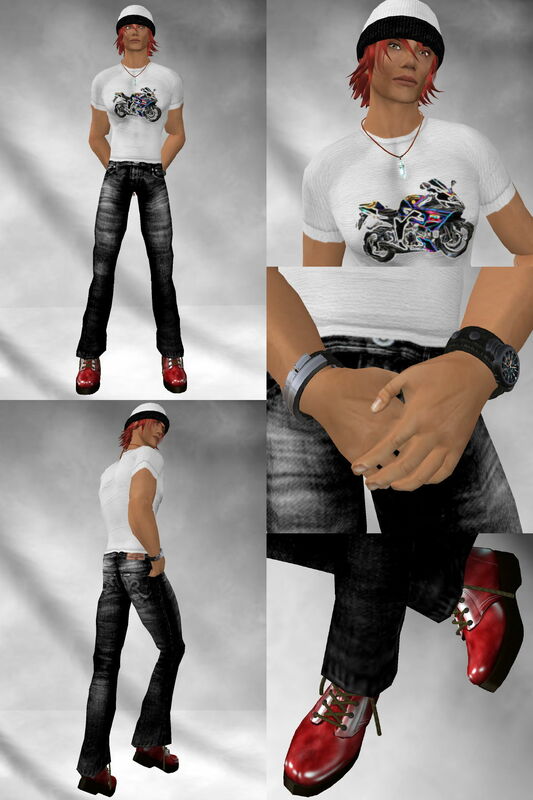 I used the nice pendant from Studio Sidhe (already featured a few weeks ago), the shiny sculpted boots from Tesla, a beanie-hair combo from Exile and the Zero Skin from Minnu Model Skin. Enjoy! I’ve known Adam Soler from Lookr since his very beginning. He is now an established designer, with a lot of stuff covering various needs. I’m showing today his new FORM suit. It comes in three colors (400 Lindens each), each color pack can be completed with a complement pack, one offering 5 alternative cuffs and the different cufflinks for 50 Lindens, one offering an alternative open shirt for 90 Lindens. 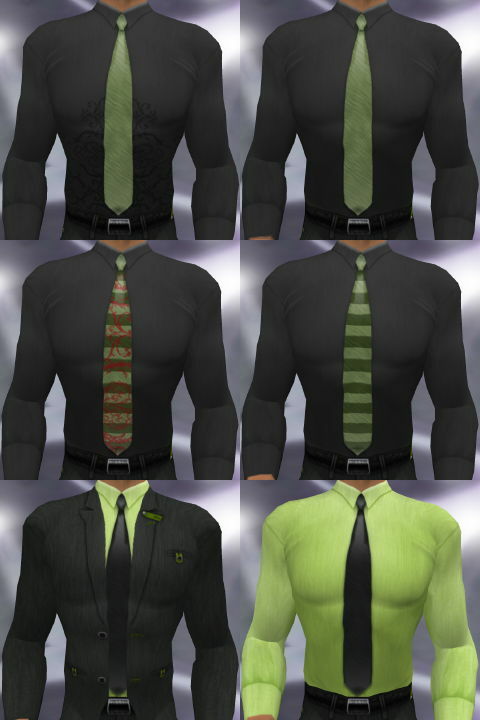 In a color pack, you will find a jacket, a closed collar shirt without tie, another one with a tie, all of them on all layers available (shirt, jacket, undershirt plus complement on the underpants layer), a pair of pants on both the pants and underpants layers, three versions of sculpty prim collar: a simple one, one including a tie knot (to wear with the shirt with tie and closed jacket, for example), and one including a full prim tie (to wear with the shirt without tie, worn without jacket, for example). You will also get a pair of sculpty cuff attachments. Everything is totally moddable and copy no transfer. FORM shows a very neat handdrawn texture with cool details. It has a strong personality without being show-off. 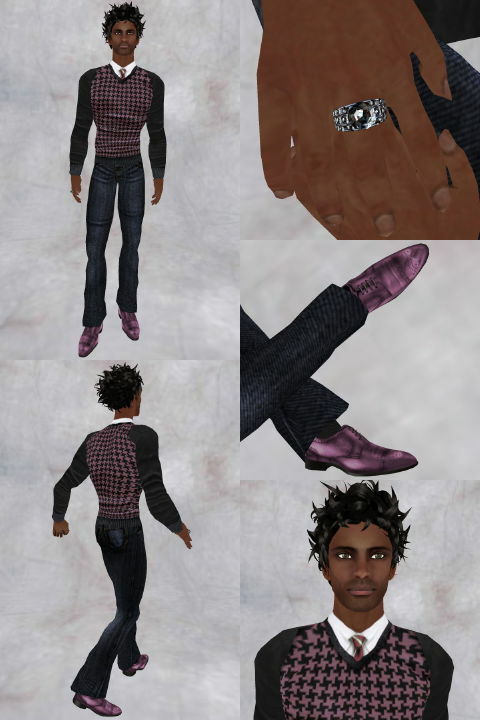 A must have for elegant male avatars! Lookr will open a new big store on a new sim on May 14th. You will find the press release after the cut! There is a modeling contest with nice prizes! Also featuring: a ring from the last collection of Mhaijik Guillaume, and another hair from Exile in one of the nice textures offered!